Odd as it may seem now, the Deep Purple classic was, for a year, as regular a part of their setlist as "Iron Man." It's no secret that Black Sabbath went through a litany of lineup changes during their near-50-year run as heavy metal's pioneers. Though the band's music often shifted to accommodate the different strengths of those members who came and went—the vastly different, but equally powerful vocal styles of Ozzy Osbourne and Ronnie James Dio for instance—rarely did it get as much of a jolt as it did when Dio left the group in 1982 and was replaced by then-former Deep Purple frontman Ian Gillan. Gillan's bluesy singing and wry lyrics were, to put it mildly, a stark departure from Osbourne and Dio's respective styles as frontmen. Though the Gillan/Sabbath partnership ended after just one album (1983's Born Again), it did give us the unique spectacle of the godfathers of heavy metal covering one of hard rock's other giants. During the Gillan-fronted tour in support of Born Again, Sabbath took to playing the song for which Gillan is most known, Deep Purple's iconic "Smoke On the Water," as an encore. According to setlist.fm, Black Sabbath played the song 60 times during the tour, which stretched from 1983-1984. You can hear a recording from that tour above. 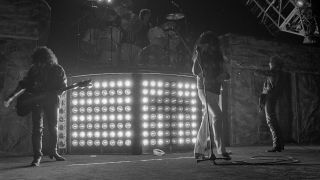 The Born Again tour, as it turns out, was notable in the band's history not only for this cover, but for the infamous "Stonehenge" set the group ordered for the stage. Intending for it to be 15 feet tall, the band accidentally put in an order for a 15 meter set. The end product ended up causing the band no end of grief, leading them to cancel several shows due to their inability to fit the whole thing onstage.